Optotek designs and manufactures articulated arms in standard and custom made types. The specifications and descriptions shown bellow indicate the range of parameters available. This is a starting point for a dialog that allows our design and manufacturing staff to meet the customer’s requirements. A wide range of bending mirrors is available. Typical laser beams that can be transmitted by OPTOTEK articulated arms are: Er:YAG, CO2, Ruby, Nd:YAG, KTP, eximer, etc. In addition to specifying the wavelength, other laser beam parameters should be provided (average power, peak power, minimum spot size, pulse duration, etc). OPTOTEK articulated arms are painted with high quality paints of almost any color (RAL scale). Available are different kind of surface finishes (shiny, riffled etc.). Two basic types of counter balance are offered: “weight” type and “spring” type. The innovative “spring” type counter balance allows the arm to be folded back (e.g. for laser transportation purposes). All OPTOTEK spring type articulated arms feature a counter-force adjustment mechanism. In order to compensate for large laser divergence, one or more lenses may be needed inside the articulated arm. The exact position of the lenses should be provided. The lenses usually have a diameter of 19 mm, in order to use the full clear aperture of the arm. The distal end connector (exit part of the articulated arm) is typically a nut that allows attachment of various devices to the arm, such as hand-pieces, scanners, etc. Standard nut thread sizes are M23x1.5, UNS 15/16″x12/1″, and M22x1.25. Articulated arms are attached to the main console of the laser by a flange. The optical axis of the articulated arm is perpendicular to the plain of this flange. OPTOTEK offers a wide range of standard flange designs. The total length of an articulated arm typically varies between 1.5 m and 2.0 m. Some applications may require shorter or longer arms. The working radius of OPTOTEK articulated arms can vary typically between 0.5 m and 1.8 m and can be of course adjusted to each customer. The lengths of each arm segment can be specified by a customer (any combination possible), taking into account technical OPTOTEK suggestions. A typical medical application requires articulated arms with 7 joints. Other applications may require other number of joints. On request OPTOTEK manufactures articulated arms with sealed mirrors and balance mechanism for outdoor applications. 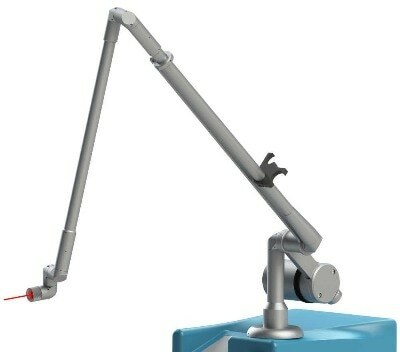 To take advantage of the high alignment accuracy of the articulated arm, position of the arm attached to e.g. laser is important. Each articulated arm is made for either right or left positioning. “Right” positioning means that when observing from the patient (or operator or doctor) side, the long segments of the arm are seen on the right side of the attachment console. If not specified differently, all OPTOTEK articulated arms are aligned according to “right” positioning definition. Understanding your application will help us to design and manufacture an articulated arm that will optimally suit for your needs.